We are back from our camping trip with my 3 siblings and family's! Did you miss us? :-) We had an exceptional 9 days of perfect weather and an amazing lack of mosquitoes! Let me share with you... this photo below was taken when we first arrived. This is the lovely little bay near our campsite. We arrived around 2 pm on Wednesday the 8th of August - and began setting up camp - Dayle putting up his Big Gas Grill next to the picnic table and and I was getting the inside of the trailer all fixed up. In the evening we hiked down to "the point" - we'd heard that you could get cell service there and we wanted to call the boys and my sister to let them know how the "skeeter" situation was so light and just check in. The photo below is when we are nearing the point, the evening sun glittering off the lake. Do you see Dayle and Buddy out there? I'm sitting on the big wooden bench, enjoying the view. This is one of my favorite shots of the week.. the flowers at the point, which were different than all the other ones that look similar to this - does anyone know what the name of this flower is? The gnarly silver tree is dead but very pretty still. After enjoying the point we hiked on around to visit my brother at his campsite. I got this shot of the rest of the lake. It's a huge 8-shape and this is looking North. 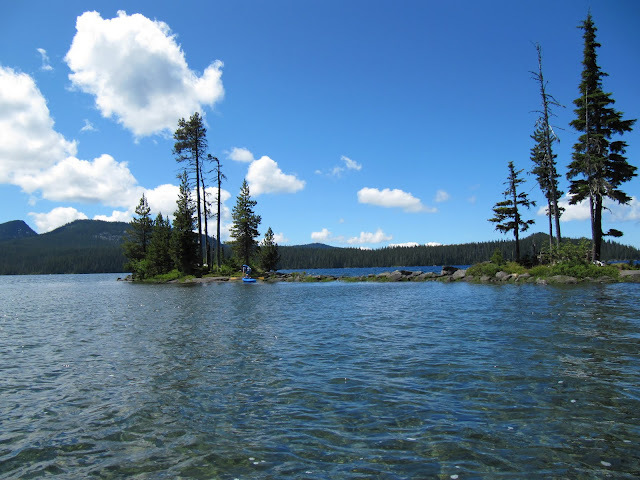 The lake is one of the 3 purest lakes on the planet, with a visibility depth of 115 feet, purer than distilled water! It's the 2nd largest natural lake in Oregon. My brother and sister used their kayaks to tow their Sunfish sailboat hulls over to our bay. Here is a late afternoon shot of their boats on the rocky side, boats are not allowed on the beach, leaving it for people to enjoy the sand. Our campsite - my sweet husband hauled my favorite rattan chair down for me. My red, white and blue crocheted bunting is hung and we worked together, with the help of my older sister, Roberta, to hang our tarp over the table - just in case of rain. We had no rain but it did keep all the pine needles off the table! Dayle and Buddy are over entering the trailer. See our 2 Sunfish sailboats on the trailer behind my Explorer? We arrived on Wednesday, we had Thursday with just my sister, brother and his wife at camp, and our 2 sons arrived with our 4 grandsons on Friday. The boys just LOVED driving around the circle on their bikes. Shawn's boys are Michael (in lime green) - 12, Gabriel (in blue shorts) - 8, and Travis' boys are Hayden (in yellow) - 4 and Caleb, the baby of the family, 3 (in red). My beloved 4 grandsons posing for me during our sunset hike to the point. Michael was handling Buddy for me while I took the photos, he tried to keep Buddy out of the water but I gave him the go-ahead to let the dog have fun and he swam and played in the water and had a blast! The flowers I can't identify in front. Another of my favorite photos of the week. Gabe, Caleb and Hayden with the camp neighbor kids Bella and Jack. In the morning Grandpa Dayle was cooking sausages for breakfast and Hayden climbed on his lap to "help". I love this shot of them looking at each other. 2nd to last to get them was ME.. and I figured that mine would be excellent since he would have the system down by the time he got to me. Here are my pancakes and boy were they YUMMY! (It was sugar free syrup.) Note - my crochet bag that I won from Shari at Shari's Crochet blog, was never far from my hands. I totally enjoyed working on my shawl by the campfire. This is one that Pammy Sue did at the blog "Scotty's Place" - and I was enthralled by the colors in the yarn and the pattern and so ordered the exact same yarn she used. I spotted the moon in the middle of the day and it was so pretty that I used the zoom on my Lumix camera and got this fun shot of it. I love this color of blue sky! From far away to close up.. I was disappointed that it seemed that all the Shooting Star wildflowers were done blooming, then I was overjoyed to see one plant with flowers still on - aren't they just enchanting? Buddy doing his favorite thing - digging in the sand. He's a Cairn Terrier and they were bred to aid Scottish farmers in ridding their properties of pests such as foxes and badgers. No wonder he was able to escape the coyote attack a few years ago! Cairns are rock piles. My boys warming up before they headed back into the water. Soon Grandpa arrived with a floating island he blew up for the boys to use. Can you believe the clarity of the water? I let Michael use my kayak and pretty wooden paddles and he was a natural at it! I gave my boat cushions to the other boys to use. Part of the excitement of the week was when we were on the beach and my sister Roberta came down and she looked at the boats lined up on the side and said "Where is my sailboat?". Oh no! It was missing! So, here is my brother on the left (Roberta's twin), Robert - and my son Travis, kayaking around trying to find her boat. I was swimming out to the island with my waterproof camera and snapped this shot of them looking. The water is deeper here, but you can still see the rocky bottom. Later in the day 3 girls arrived at camp to tell us that they'd found the boat at Klovdahl Bay across the lake and towed it back and pulled it up on the beach! Roberta was overjoyed! Over the years people enjoying the island have stacked up rocks to make a fort. I love it. 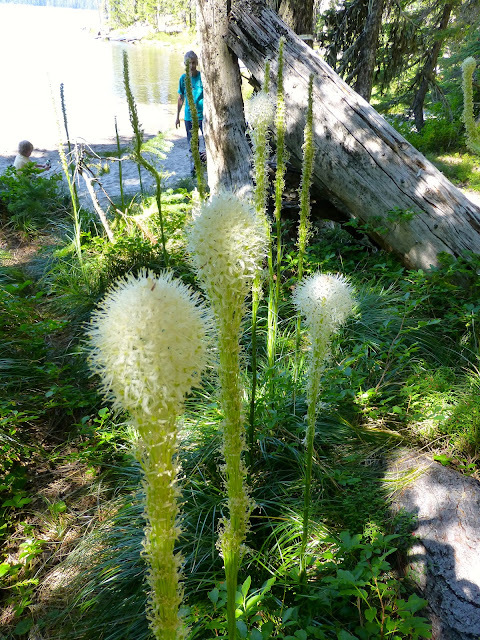 Off the bay I found a few stalks of Bear Grass still in bloom - most were done blooming. These are so pretty and lacy! The Huckleberries had been harvested by prior campers - here is one that was left. One year our Mom was at camp and we'd rented a big motorhome which had an oven, so all of us kids picked huckleberries and she made several pies for us. Good memories. Travis and the boys camped in their vintage VW bus. Here is our son, ready to head home. On Tuesday my younger sister Denise arrived, bringing her friend Marcia on her first visit to the lake. We launched our sailboats that afternoon before they came and headed to "Amy's Blue Lagoon" - my sister Roberta named it after taking our daughter Amy on a canoe trip there. It's our favorite swimming hole. Denise and Marcia joined us in the lagoon in their kayaks. That night Dayle made his famous "Chicken Teriyaki Yakisoba" dinner (with my supervision) :-). Can you believe that we almost polished this off? We sent a plate of it over to my brother's camp and sent a plate with our son Shawn as he was leaving from the lake the next day to head to 5 days of camping on the dunes at the coast near Coos Bay and ride their quads. My sister Roberta got this great morning shot of the lake when it was like a mirror. Pretty! On our second evening of dinner with my sister and Marcia, Dayle made baked potatoes and grilled filet mignon. Denise provided a welcome salad full of fresh veggies. They stayed in a hotel in Oakridge and came up to enjoy the lake for 2 days. Our group photo is small, as we forgot to take one when our boys were there - but we got this one with all 4 siblings, 2 spouses and my brother Rob's daughter and son with his wife and 3 little boys. On Wednesday when we were sailing back from our swim in the lagoon, we noticed a plume of smoke just off the rim of the lake!! We then saw helicopters dumping water on the fire and then other helicopters that were dropping crew to fight the fire. In the late afternoon a US Forest Service Policemen came around to all the camps to inform us that if the fire got out of hand we should be ready to evacuate the camp ground! We had good sailing on 3 days - here is Dayle and his boat in our swimming lagoon. The water is brisk but worth it as it's just so beautiful and clean. I took this photo on our way to the lagoon. The water is so deep out here it's the color of cobalt blue. My sail - it was a custom design to promote the movie "Tequila Sunrise" with Mel Gibson, Michelle Pfeiffer and Kurt Russell. The person who sold it to me won it at a video convention in Las Vegas! :-) I got it brand new in the box for at least a quarter of it's value. Our 4 sailboats on the shore, me in the water swimming shooting shots. Thursday - heading out of the lagoon, this is the shadow of my boat on the bottom of the lagoon and the reflection of my sail in the water. We are heading to the boat launch to load our boats. ::sigh:: I always get sad when it's time to leave. Dayle and Buddy (in his life vest) heading out to the boat ramp. We woke up on Friday and after coffee and a muffin, Dayle packed the chairs and got everything ready outside the trailer, I was busy inside stowing all the gear for the trip home. We said our goodbyes to my brother and his family and headed down the mountain. Here is my favorite view going down - Dayle and the trailer and the pointy mountain which I can't remember the name of. I'd always wanted to photograph this covered bridge that is on the way to get the I-5 freeway, so I took the opportunity. It is no longer used, but has been saved and is beautiful. I enjoyed every moment in your post, such a beautiful place to be. I bet the air was so clean and the the water sparkling. It looks like a fantastic time was had by everyone. Glad you are home safe and sound. Such a delightful vacation for you all! Your pictures are wonderful - so well shot. Even if you had not written any words, your pictures speak so well and share the story of a great family outing. I was thinking about you when I heard about the fire that popped up over near Waldo lake. Way too many fires going on lately. We stopped by the Forest Service air base in Redmond tonight and there were four air tankers there ready to go. Last night there were two water bombers there on loan all the way from Minnesota! wow, it all looks so beautiful. Think you have a slight advantage in planning things where you live - over here you can't plan to do something in the afternoon on the same morning because it could be raining or blowing a gale, or blazingly hot..... sigh. I think it's great how you and your family rub along, joining each other for this and that but never crowding each other, and your 'camp' - blimey!!! That's a camp - so jealous. The cooking is very impressive too, you should see what complete dross I cooked for us on a camping trip a few years back ha ha. It would make your hair stand on end. You have taken some lovely photos - the moon, your grandsons running into the water and your pup are my favourites. Love reading your blog and tales of your warm happiness-filled life. Well done you. Hello Teresa...Your photographs always leave me breathless...the scenery is amazing! So lovely for you all to be able to enjoy a big family holiday together...your trailer looks fabulous and I love the camper van too...the pic of Buddy is adorable! Teresa, That was amazing! What a vacation you had. The weather, water, family, food and scenery are spectacular!!! You guys sure know how to do it, but I bet it takes a lot of planning and organizing. Great job Teresa!!! Loved your campsite and home away from home. All you blankets and pillows looked so at home and cheery. The boys are so cute. It's so nice to see the love they have for both of you and the fun they have. You are really making so many memorable times for them and yourselves. Terrific photos of beautiful scenery, happy family, yummy food, and lovely crochet projects! Thanks for sharing! Looks like you had a lovely trip. Glorious post-utterly idyllic and I almost felt like I was there-I wish!!! Good to have you back Teresa and from all the photos it looks like you had a wonderful time with family. That clear water is amazing! There are so few unspoiled places anymore. You sure stayed busy, and the kids look like they were having so much fun. All that fresh air and the scenery, I can truly understand why you love that vacation spot. I'm glad you got some hooky time, packing a wip is always one of the things I also make sure is in the suitcase. I won't even mention the food, doesn't everything taste better over an open fire? Thank you for sharing some Paradise with us. I did take the time to check out your Etsy Store and a few other points of interest on your sidebar. I love the jewelry and will try and come back this week and buy something. Your artwork is awesome, I did not realize you are so artistic. You know how I feel about your dollhouse, and it only reminds me to get busy on my own. You take care, have a good week resting up from the vacation. H Teresa! I certainly missed you! I have been gone all weekend too. Just got home. Your pics are wonderful, and I can see why you love going there so much. This reminds me of our Bass Lake up near Yosemite! Probably the most fabulous post ever. So much going on I don't know where to begin. What a great trip this was. You sure know how to camp in style. And those wonderful meals. I so need to get us out that way one year. Glad to see you are back. We are doing well here and finally have a break in the weather and have been out all weekend bike. Can't wait to see what's up next out your way. But, first grab a shower and a good night's sleep. I read every word and thoroughly enjoyed every word and every picture. I made a fast trip to Portland on Friday & Saturday and couldn't believe how hot and dry it was there. 106 in The Dalles as we drive through!!! We have also been enjoying our trailer - wouldn't it be fun to go together sometime? Thank you for the trip, I feel like I was there too. Hello Teresa! Such wonderful pictures of such a beautiful place! How lovely that you spent such happy family times there, it all looks just perfect! And the camper looks so comfortable and well equipped too :) Have a happy week back home. It sounds like you had a wonderful time. The lake is soo beautifu. I will be putting this on my bucket list. lol The pics were awesome. I loved the one of the log under water 15 feet down. It must be really chilly with all the natural springs feeding it. Gorgeous though! Thank you for sharing! Absolutely loving the shawl, can't wait to see more! I can't get over how clear the water is in the lake - it looks absolutely beautiful! I don't like open water swimming but I reckon even I'd give that a go for sure! I'm so glad you had an amazing time with family! For sure that are unforgetable moments in life! Thank you for sharing with us! PS: I so much love your crochet blankets, too. They are very delightful!!! Hope your days are always gorgeous!!! Wow! Cool camping site indeed. I can think of a lot of things here in this place . Cool! WOW Teresa that is absolutely gorgeous. You guys really know how to camp! That is inspiration for me -- how glorious. Thank you! OMG, this was so fun to read through. I get a gold star because I read every word! All of your food looks so good! Of course, I would mention those first. I need to make that Yakasoba Chicken again. Your pictures are just beautiful! Looks like you had a wonderful time. Awww it looks so wonderful! I am glad you enjoyed your time. Thank you for sharing your heaven. I love all the post and the beautiful pictures !